Its amazing what a difference a couple of adjustments can make. I raised both the seat angle and bottom bracket, and the trike handling has improved immensely. As you can see in the photo above, I pulled the bottom bracket off and inverted the sleeve, so now the bottom bracket is on top of the boom rather than underneath it. This means I can pull tighter corners while pedaling. I still need to pull the rocker arms off and change Angle C back to110°. The trike feels much more ridable, or maybe I am just getting better at it. Everyone at work had a go, but surprisingly they all found it very difficult to ride. Some found it much harder than others. You may also notice I changed the pedals and cranks to a scrappy set, so my good ones wouldn't get trashed in the process. After quite a bit of tinkering to get Jetrike road worthy, I entered it into the local Bike Week City to Coast ride. 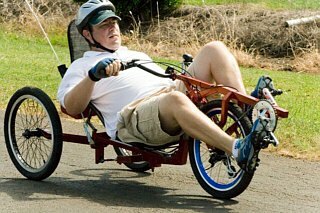 Jetrike is my first recumbent, and this was its first big ride. 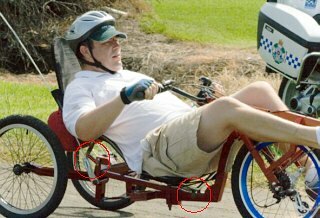 The seat on Jetrike is still to high, so the self centering effect doesn't work quite as well as it might. I generally can't balance the trike when stationary and have to unclip my cycling shoes when I stop. 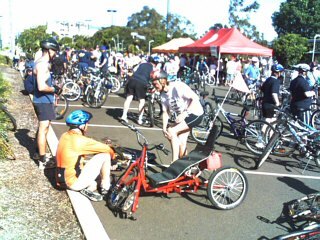 Jetrike was the only trike at the over 400 cyclist event. There were only two other recumbents, one was a LWB and the other a TT/Cruzbike clone, both home made. 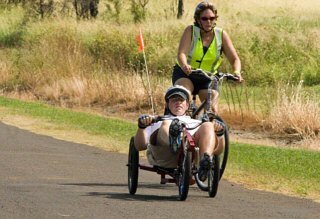 The ride started at Riverside Parkland in Bundaberg and ended at Burnett Heads, a total distance of 21km, over relatively flat terrain, with strong gusty head winds in some sections. After riding home after the event, I totaled 40km for the day. This was not a race, just a social ride, so there were lots of rest stops serving water, locally produced ginger beer and sliced watermelon. I must congratulate the organizers of the event, they did a great job, and I had a lot of fun. The start was very congested, which was really quite nerve racking for me. It is strange to be so low to the ground and be surrounded by so many ordinary cyclists, jostling for position. All you could see was a forest of wheels and legs. We went straight from a large mob in a car park, through a roundabout into virtually single file riding over a small narrow bridge. Everyone was having to put their feet down in stop-go traffic. After the first rest stop and a small hill with a head wind, the field started to thin out. My average speed for the ride was 18kmh and my maximum speed was 44kmh. Once the field began to thin out, and we hit a head wind, I was constantly passing other riders -- I doubt that was due to any increased fitness on my part. Here I am with a rather serious look on my face, approaching a stop sign where a police officer was directing cyclists across the busy port road. I managed to lower the seat by about 50mm by unbolting it from the front mount, moving it back and resting the brace on the frame. To do this I attached two 100mm stays (80mm center to center) and bolted them between the seat and the frame at the back (photo above). This had the effect of increasing the seat angle slightly and moving it back about 80mm. Despite these changes, the seat is still too high, and the self centering effect isn't strong enough to balance without putting a my hand or a foot down. I also changed Angle C to 90° in an attempt to improve the self centering effect, but I now believe this is too severe, 110° felt better, so lowering the seat seems to be the only option. With Angle C now 90°, the influence of road camber can be felt. One has to lean against it to keep the trike vertical. Going off a deep road shoulder with one of the back wheels is actually quite challenging, but as long as you catch it quickly enough, recoverable. Once again, when Angle C was 110° road camber was virtually unnoticeable. This was quite a surprise, I needed to move the seat back to improve stability and handling. Just 80mm made a huge difference. I would suggest that the CoG should move back even further, but then you would loose too much traction on hill climbs. 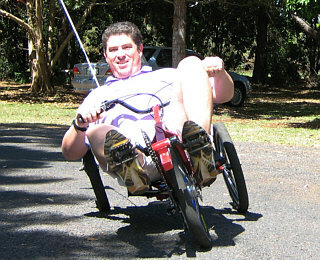 The trike is stable climbing hills but starts to weave when I pedal hard going down hills. This is because the CoG shifts forward on a downward slope. This could also be mitigated by moving the CoG further back. With shorter 150mm cranks, the idea was to have a higher cadence, but to fast a cadence and the whole front end fish tails, so a smooth even and moderate cadence was necessary. When I started this project, one of my hopes was to create a trike that self centered and also had a 450mm seat height so my line of site would be equal to motorists. 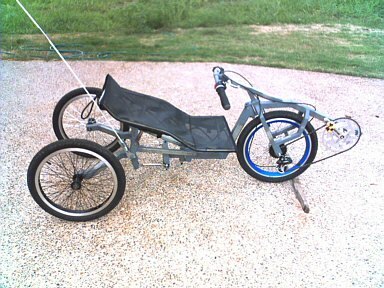 The way this design is heading that isn't a possibility, and while I am curious to see if I can get this tilting trike design to work, I am not sure if I like riding that low to the ground anyway. 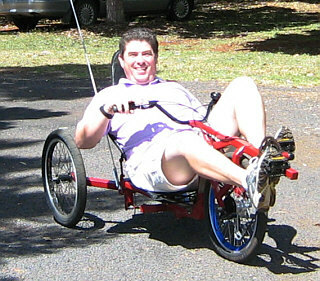 So I may end up with a self centering trike that I don't feel safe riding on local roads, but is great fun to ride. Maybe motorists up here just arn't ready to share roads with trikes, they are bad enough with bikes. But then again, a whole bunch of other motorists tooted and waved so who knows? When the sugar cane harvest starts, I wouldn't want to be dodging haulouts that low to the ground -- it would seriously freak me out. The more I rid my Jetrike, the more I am starting to wonder if this tilt geometry would be better suited to a tadpole. That may well be my next design. I have corrected the Trail by cutting the main pivot hinge off the Drive Train, adjusting the angle by 10° and rewelding it back into place. I am away all week at a conference, so I will have to wait until next weekend for a test drive -- I can't wait! There is still a problem with the front wheel trail causing flop. I have done some research into this and started a new tail page with some analysis and tables with trail calculations. From this I have discovered that with my current setup the trail is out by at last 20mm and as much as 60mm. The reason is that I didn't account for differences in wheel size when I applied Laurent's geometry. So I will have to do some major surgery on the front of my trike and see if I can improve things, but that will have to wait for the weekend. Well rather than give up on the existing drive train, I have set about seeing if I can alter the geometry in some way to get the self-center effect working properly with the high seat. Its probably a bit extreem, but I have changed Angle C to 90°. As soon as the weather clears up -- its been raining all weekend -- I will take it for a spin. I took the new trike for a spin today, then a longer ride of a few kilometers. Here is what I can report. For anyone considering building a TT clone, Laurent Dechenne's Speculoos drive train worked flawlessly. There is very little if any peddle induced steering. That being said, there are few problems with my implementation of it. Basically its just too heavy, and this creates a fair bit of inertia, that makes the steering a little less responsive than my liking. If I build one again, I would strip the weight right back, by using lighter profiles and less metal. As for the self centering effect. It works! When you ride along in a straight line, it feels like regular trike, holding you level. When you go into a corner, and start to lean, you generally lean all the way over until you hit the tilt lock, and then if you need to you just lean a bit further out and you can take fairly sharp corners comfortably at high speeds -- certainly faster than I would attempt on a regular trike. There is also no noticeable influence from road camber, and the rear end actually makes riding over uneven surfaces smoother. At one stage when I was turning around, the rear outside wheel clipped the edge of our driveway and rode up onto the curb, then bounced off, all while I was at full tilt, and it had almost no influence on my steering line. I actually did it again deliberately just to see. All that being said, I now worry that the Speculoos drive train might be poor choice for this trike. With Laurent's geometry, the seat height is supposed to be equal to the BB-Height. It turns out that this is just simply too hight for my self centering geometry in the current setup. My seat is currently 340mm, but really needs to be 250mm. The self centering effect, only worked when I took the seat frame off, and put a sheet of ply on the frame, and rode around sitting rather uncomfortably on that. With the regular higher seat, the self centering effect doesn't work at all, and actually makes the low speed stability very tricky. However, with the lower seat hight, pedal induced steering was noticeable. So it looks like I will either be chopping the front off and replacing it with my original Python drive train, or seeing if I can come up with some changes to the geometry that get this higher seat height working.